Abstract: This article reports on an autoethnography in which eight researchers interrogate their experience in a cohort-based education for sustainability advanced certificate program for evidence of practices that generated hope and agency, and worked against the hopelessness that can come with studying a problem as big and seemingly insurmountable as sustainability. They found that learning about and tackling wicked problems as a community of practice undermined debilitating pessimism and generated productive hope and collective action. I think there is hope in numbers. 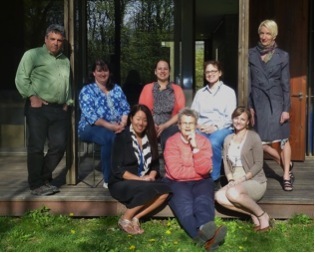 In June of 2014 our band of autoethnographers gathered together in a coffee shop in Croton-on-Hudson to design a project that we believed could contribute to the Journal for Sustainability Education’s (JSE) call for research on hope and agency. As a group of inspired students and a stalwart professor, we had just completed an eighteen-month, five course journey together in an Education for Sustainability (EfS) Advanced Certificate Program at Manhattanville College. By all rights, the students in our group could have considered themselves to be done with the program. With certificates in hand, they could have easily scattered to the winds, but they didn’t; we didn’t. Each of us had the sense that we weren’t done; we still had work to do, and we wanted to do it together. We were a team; we were a close knit cohort of learners and we wanted to find ways to help others benefit from what we had learned about the power of community. Contributing to the body of research found within this themed issue seemed to be a very good place to start. With the detail of JSE’s call for research in hand, we set out to interrogate our own collective experience as teachers and learners for a sustainable future to see if we could find evidence of practices that generate hope and agency, and work against hopelessness that can come with studying overwhelming socio-ecological problems. We believed the editors of this issue when they cautioned that simply scaring students with dire findings from scientific and social scientific research is more likely to lead to paralysis than action. We were intrigued by Tina Evans’ (2012) proposition that a kind of “clear eyed hope” can be generated when students critically examine and reflect on the ways in which perceptions and actions are socially mediated and culturally regulated. And we were further compelled to examine the effects of our collaborative learning experience by Evans’ suggestion that integrating praxis into sustainability education can mitigate feelings of hopelessness that often arise when social structures and hidden cultural norms are not examined and challenged. When we explored what was being written in the literature about hope and agency, we found that like the editors of this themed issue, educators from environmental sociology argue that when it comes to motivating social action for social change “fear won’t do it” (O’Neil & Nicholson-Cole, 2009, 355) James Sheppard (2009) contends that while increasing students’ awareness of the depth and breadth of the environmental issues is clearly an important part of environmental education, this increased awareness can all too often lead to unproductive pessimism. Michelle Lueck (2007) explains that in environmental sociology, when students learn that social problems are rooted in social structures, they can fall prey to the pessimism that comes with an inability to see how personal agency can make a difference. Lueck laments that in the process of focusing on structural explanations for socio-ecological problems, professors of environmental sociology can, in the process, seize agency from their students. Bret Johnson asks, “[when] we teach about social problems, do we empower our students to create social change or do we germinate cynicism, powerlessness, alienation and civic disengagement” (2005, 44)? And finally, Saffron O’Neil and Sophie Nicholson-Cole show us that fear-inducing campaigns are ineffective in motivating “genuine personal engagement” with climate change (2009, 355). If pessimism is more likely to produce disillusionment and despair, and if we have to be careful about sharing too much distressing information with our students for fear of sending them into a passive, shut-down mode, what is the antidote? How can educators for social change create learning environments where students can accept the premise of and take personal action for a problem as big and seemingly insurmountable as sustainability? This autoethnography seeks to interrogate our experiences as a community of learners in an education for sustainability advanced certificate program as a means for exploring ways in which hope and agency can be generated in sustainability education, and can act as antidotes for the debilitating pessimism that can come with learning about sustainability as an overwhelmingly complex socio-ecological problem to be solved and urgent sociocultural aspiration to be achieved. On that day in the coffee shop in Croton-on-Hudson, we crafted a plan for doing an autoethnography together in which we would explore our collective conceptions of hope and agency to see if we could find evidence that hope and agency were being generated as we participated in a cohort-based EfS advanced certificate program. We all agreed to write independent journal reflections in response to a set of prompts we created regarding the ways that we would define hope, the ways that we would define agency and the ways in which our participation in the program did or did not increase our own sense of hope and agency. Knowing that we needed to better understand the ways in which hope and agency are understood and theorized in the literature, we asked Sherie—the professor in our group—to place our ethnographic work within a conceptual framework that could help us ask questions and make sense of our experiences in the EfS program. Sherie’s broad review and synthesis of literature from the political and social sciences led us to conclude that the concepts of collective hope, communities of practice and praxis offered the greatest potential for helping us understand and explain the degree to which our work as a community of learners generated hope and increased our sense of agency (Braithwaite 2004a, 2004b; Evans 2012; Wenger c2007). Hope theory, in general, and collective hope, more particularly, provided productive conceptual lenses for interpreting our journal writings about the ways in which we defined, operationalized and experienced hope and agency in our program. After exploring hope theory literature, we came to conceptualize hope and agency as inextricably linked. Thus, we concluded that examining our experiences for evidence of hope and agency would require that we understand the ways in which they relate to one another. Victoria McGeer (2004) contends that in addition to being a unifying and grounding force in human agency, hope is one of its essential and distinctive features. Michelle Lueck (2007) argues that hope is a crucial component of agency, and scholars from positive psychology like C.R. Snyder define hope as a “cognitive set” that is made up of agency and pathways to achieve goals (Snyder et al 2000, 321). These linkages of hope and agency gave us an overarching framework for examining our individual and collective experiences of them. Based on the value we placed on our perception of the benefits we gained from working and learning as a community, we were drawn to the work of a group of scholars who introduced us to the theory of collective hope (Braithwaite, 2004a, 2004b; Courville & Piper 2004; Drahos, 2004; McGeer 2004). We wondered if the benefits we experienced as members of a community could be better understood through Valarie Braithwaite’s contention that collective action is sustainable when individuals engage in a collective hope process in which a “shared desire for a better society, articulated through a broad set of agreed-upon goals and principles, developed and elaborated through socially inclusive dialogue” (2004b, 146). In building a case for collective hope in environmental sociology, Michelle Lueck contends that becoming involved in a social movement for change requires individuals to go through a collective hope process in which they decide whether or not they share the goal of the collective, whether they perceive the goal to be possible and whether or not their contribution will be “worthwhile to the collective process” (2007, 252). As we considered the potential importance and applicability of this collective hope process, we found ourselves wondering whether the ways in which we experienced ourselves as change agents might be evidence of collective hope. Insights gained from Reese & Bamberg drew our attention to the idea that “group identification is a powerful driver of social change” (2014, 467) Group identification, they argue, encourages people to display commitment to the cause of changing society, to form coalitions with similar groups, and crucially, to act together in order to achieve their political goals” (2014, 467) These insights about the importance of group identification led us to explore and employ Lave and Wenger’s theories on the effects of communities of practice on social learning and social change (Lave 1991; Wenger c2007). Wenger defines communities of practice as “groups of people who share a concern or a passion for something they do and learn how to do it better as they interact regularly” (2007, 1). And Lave argues that developing an identity as a member of a community of practice and becoming knowledgeably skillful are part of the same process (1991). Lave and Wenger’s conceptions of the characteristics and effects of becoming a member of a community of practice combined with Reese & Bamberg’s insistence that group identification is important for collective action, led us to identify community of practice as a conceptual lens that might help us understand our perceptions of the importance of being a member of a cohort that was engaged in learning and working for social change. And finally, our reading of Tina Evans’ critical social theory (CST) of sustainability led us to consider the degree to which we, as a learning collective, were engaged in sustainability praxis (Evans, 2012). We wondered if our capacity for action and the nature of our actions were motivated and informed by our exploration of and reflection on challenging social theory. Evans explains that “sustainability praxis provides a foundation for hopeful engagement with the world in the realms of education and society more generally” (2012, 10). Evans’ focus on agency and claims about hopeful engagement with the world through sustainability praxis provided a framework for us to examine our experiences for evidence of praxis and explore the possibilities that our engagement with praxis contributed to our sense of hope and agency. Specifically, we found Evans’ conception of “clear-eyed hope” to be particularly compelling. Drawing on Vaclav Havel, Evans explains that this kind of hope is expressed when we see that there is value in doing the right thing even if we understand that the problems that we face are deeply rooted, dauntingly complex and the probability that our struggles will lead to a better world is uncertain (2012, 287). We wondered if we were engaged in praxis and whether or not this praxis compelled and sustained our collective hope and collective action. What meanings and significances can be drawn from our reflections on hope and agency within a cohort-based Education for Sustainability Advanced Certificate Program? What are the symbolic and concrete representations of hope and agency in the social practices of the EfS cohort and their professor? In what ways do these social practices represent collective hope? In what ways do these social practices represent clear-eyed hope? What are the symbolic and concrete representations of communities of practice in the social practice of the EfS cohort and their professor? In what ways do these social practices represent praxis? What can an analysis of the meanings and significances of participants’ experiences in a cohort-based EfS advanced certificate program tell us about generating and maintaining sustainability-oriented agency? What can this analysis tell us about catalyzing hope and agency rather than fear or despair? What can this analysis tell us about cultivating resilience in learners for the long haul? When we thought carefully about what we were trying to accomplish with our research, and which methods would allow us to continue to work as a cohesive, interdependent group, we concluded that autoethnography was the best fit. Caroline Ellis, Tony Adams and Arthur Bochner (2011) describe autoethnography is an approach to research that seeks to describe and analyze personal experience in order to understand cultural experience. As a method, they explain, autoethnography is a combination of autobiography and ethnography where researchers “retrospectively and selectively write about epiphanies that stem from, or are made possible by, being part of a culture and/or by possessing a particular cultural identity” (2011, 2.). Further they explained that co-constructed narratives as a form of autoethnography illustrates “the meanings of relational experiences, particularly how people collaboratively cope with the ambiguities, uncertainties, and contradictions of being friends, family, and/or intimate partners” (2011, 4.1) These descriptions resonated deeply with our desire to find a research method that would allow us to explore the implications of the culture that was formed in our learning community for generating hope and agency. We wanted to retrospectively reflect on, analyze and consider the effects produced in the culture of our learning community, and we wanted to do it together. We did not want it to be done to us. With a degree of postcolonial sensibilities, we placed judgments about validity and reliability in our own hands, and in our own reflections and analyses. What does hope mean to you with regard to education for sustainability? What does agency mean to you with regard to education for sustainability? What if anything in your experiences in the program generated those things for you? Do you feel more hopeful as an educator for sustainability after taking this course? If so, why? After our responses to the first round of prompts were written and uploaded into a shared document, Sherie set out to better understand the ways in which scholars from the political and social sciences conceptualized and theorized hope and agency. When she found the theory of collective hope and felt a deep resonance to it, she asked us to turn our attention to the role of the cohort in our experience of hope and agency. She asked us to write reflective responses to the second round of prompts listed below. How did it feel to go through the EfS Advanced Certificate program as a member of a cohort? How, if at all, do you feel that benefited from being a member of this cohort? How, if at all, do you feel that you continue to benefit from being a member of this cohort? How, if at all, do you feel that being a member of this cohort was difficult for you or proved to be a disadvantage? How, if at all, would you like to continue the work of the cohort? How, if at all, did being a member of the EfS cohort contribute to your sense of hope and agency? Six of us were in a place in our lives where we could dedicate the time necessary to write reflective responses to the first round of prompts. Two of us were unable to commit to this part of the writing process. However, we were all part of the autoethnographic process. Our contributions came in the form of writing journal responses, reviewing literature, analyzing data, writing drafts, reviewing drafts, and adding comments to those drafts. In this way everyone’s voices are included through the questions they raised, the affirmations they provided and the comments they included. Our data for this research consisted of reflective responses to the two rounds of prompts that were generated to interrogate our general perceptions of hope, agency and the effects of our EfS advanced certificate program on the generation of hope and agency. To analyze this data, we moved between a process of looking for themes that emerged from the data to a process of looking for ways in which our conceptual framework might help us explain these emerging themes. When we interrogated our first round of reflections, four themes emerged: 1) the relationship between hope and agency, 2) hope in the face of the overwhelming obstacles, 3) the role of critical readings and tackling challenges together, and 4) hope in numbers. Following this process of looking for emerging themes, we moved to a process of looking for connections between the themes that we found and our conceptualization of hope and agency from the literature. Specifically, we looked for the ways in which our experiences were evidence of collective hope; our experiences as a cohort were consistent with the benefits of communities of practice; and ways in which the ideals of praxis could be applied to our perceptions of agency and collective action. The goal of our analysis was to gain a better understanding of meanings and significances that can be drawn from our reflections on hope and agency within our cohort-based EfS program and to determine what these meanings and significances can tell us about generating and maintaining sustainability-oriented agency. Each section below consists of quotes from our reflections that we felt most represented these themes, followed by a brief analysis in which we endeavor to use the lenses borrowed from theories on collective hope, communities of practice and praxis to increase our understanding. Agency means taking action, as opposed to just seeing things and sighing and letting them pass you by. Agency to me is people having the confidence to try to make change. Agency is the desire to pursue change. It is the desire to act and to be a participant. Sadie: I think informed hope is an essential quality to any successful change agent and any sustainability action. Autumn: Creating realistic hope in which the possibility of change and the real desire for change must be accompanied by active participation, at the appropriate time, and in favor of a sustainable future for all. In these reflections we see that the connection we are making between hope and action and between action and agency. Either because we see hope to be an essential quality for being a successful change agent or because we define hope in terms of changes we see or would like to see, these reflections exemplify the ways in which scholars like Victoria McGeer, Michelle Lueck and C.R. Snyder have argued that hope and agency are inextricably linked (McGeer 2004; Lueck 2007; Snyder et al 2003). Specifically, the perceptions expressed in these quotes appear to support McGeer’s thesis that “hope is an essential and distinctive feature of human agency” (2004, 100). Diane: Hope is that ability to keep moving forward even when you think the task ahead is monumental or in spite of failure. Hope is the desire to keep trying, regardless of perceived outcome. Hope is not giving up, even when progress is slow or when an obstacle causes progress to be lost. Hope is the conviction that change can happen. Hope is not the magical ingredient added in measured amounts to an EfS dish; as if there was a magical cookbook of recipes for a sustainable future. that we dip into the student outcomes of our EfS work. Hope is not a means to an end, or an end seeking means. It is an integral element; unable to be separated, distilled, siphoned or served a la carte. Sadie: Hope means being aware of these four groups [of people] and still believing that change is possible… I do not think I can accurately compare my feelings of hope before taking the advanced certificate program to after because I was really just starting to become aware of the enormity of sustainability issues when I started the program. However, I can definitely say that I came out of the program with a resolved and informed sense of hope. Christina: Hope means I think there is a substantial chance that the mind shifts and changes in behavior that are required to keep the planet and all of its systems from collapsing will happen in a timely manner. Unfortunately, I just don’t see that happening. That being said, I am not deterred from doing what I can to help my students be aware of the changes that they need to embrace. Hope in the collective sense must be equipped to account for contradictory hopes by other groups. This is where the agentic power of hope is most crucial. Agency is used to plan for obstacles because substantial hope is said to be flexible and ingenious in its methods to work with obstacles (Braithwaite 2004b). Obstacles must be included as a natural part of the process; if obstacles are seen as insurmountable or ignored, the agentic power of hope is dissolved and despair arises (2007, 252). Diane, Alan and Sadie appear to express this agentic power of hope when their definition of hope includes a clear acknowledgement of significant obstacles. We see important connections between what Michelle Lueck (2007) describes as the agentic power of hope and the ways in which Tina Evans describes “clear-eyed hope” as “a notion that there is value in doing the right thing, even in the context of knowing the daunting problems we face and recognizing the outcome of our struggle for a better world is uncertain” (2012, 287). Interestingly, in her reflections on hope, Christina says that she feels no hope with regard to sustainability, yet she is “undeterred” with regard to taking action as an educator for a sustainable future. Does this contradict our claims above about the inextricable connection between hope and agency? Does Christina feel agency without hope? Or does this quote indicate that while she does not claim feelings of hope, the fact that she is undeterred and willing to act signals some tacit sense of hope that her efforts will make a difference; even if the ideal of a sustainable future feels impossible? When we raised these questions, Christina responded by saying, “I still am not feeling hope but I don’t feel like that is a valid excuse for doing nothing or contributing to the problem. I’m not hopeful that what I am doing will have a positive impact but I know that if I don’t make an effort it definitely won’t happen.” This response seems to reflect Tina Evans’ (2012) conception of clear-eyed hope in that she is willing to act, even if she doubts that the outcomes of her struggle for a better world will ultimately lead to a sustainable future. Lisa: Although we read some grim facts (especially in Eaarth, etc,) I am amazed at all of the efforts I see under way – carbon caps, awareness of pollinators, decreased use of pesticides, more recycling and reusing, etc. I think reading Eaarth and some of the other readings definitely contributed to my sense of agency. Diane: At times the reading material felt depressing and hopeless… This was an early concern as I wondered if I would be able to process the information in a positive way for myself… The exposure to factual reading material, a professor who is passionate about the subject and a cohort of people in a supportive and flexible learning environment provided me with a sense of hope and agency in Education for Sustainability… The readings presented the facts and many alternate views but I was able to discuss, understand and work with them in a supportive environment with a group of people who were willing to share opinions and respect the opinions of others. Sadie: Reading Eaarth, and materials like it, did disengage me and make me feel hopeless for a short period of time (which I think is normal and healthy), but I only think I finally changed my opinion of works like that because I am a balanced adult and I had the support of my cohort and the EfS program. Alan: Each reading presented new opportunities to our cohort to exercise different “muscle groups.” While digesting common obstacles and challenges to a preferable future often presented by the readings, we engaged in a “belief adjusting process” that supported both our personal and collective sense of purpose. Cheryl: The critical readings gave me hope, because no matter what we read regarding sustainability, it always came back to social justice. To be able to discuss as a group that the earth is not only being plundered and pillaged, but that societies and cultures are experiencing ruin due to this plundering, was very eye-opening. A group discussion not only challenges the way you identified with the reading, but also validates your feelings—empowering the agency within. Autumn: Our “wicked problem” project was one of the most influential experiences in creating hope and agency. Our collaboration led us through a complex journey and allowed us to explore key players in many scenarios. Each week, we were tasked with dissecting big ideas and creating connections to larger meanings. I think when you are in a group there is both more support (you don’t feel that you have to do all of the change making and that you’ve got others to lean on if you need to) and more pressure/responsibility (once you start talking about something you see that need to change and others verify that it does in fact need to change, it is no longer acceptable to shrug off the problem. If the problem directly impacts the people you are discussing the problem with, the pressure is even greater to take action. In this response, Christina makes a connection between her motivation to act and her membership in a group that is practicing collaborative reflection. This connection not only highlights the benefits of “reflection in community“(Rodgers, 857), but it is also reflective of Paulo Freire’s conception of Praxis (Freire 2000). Citing Jack Mezirow, Smith and Eaton (c2015) explain “[this] kind of praxis implies change. Reflection becomes a recursive cycle, leading to a re-evaluation of theory and a reassessment of the actions that grow from theory, so that change for the common good can occur”. Lisa: It is nice to know that they [the cohort] are all out there and that I am not working in isolation… I think there is hope in numbers. If one is the only person trying to educate for sustainability, it can seem insurmountable. For me, being part of a cohort was in itself a sign of hope, because it indicated that there were others from other walks of life that shared a goal. Christina: I think that maybe being part of a group does sort of support agency. When you are alone it is easy to say “what can one person do?” or “I already have so much going on, I can’t possibly take on one more thing”. But I think when you are in a group there is both more support (you don’t feel that you have to do all of the change making and that you’ve got others to lean on if you need to) and more pressure/responsibility (once you start talking about something you see that need to change and others verify that it does in fact need to change, it is no longer acceptable to shrug off the problem.) If the problem directly impacts the people you are discussing the problem with, the pressure is even greater to take action. Sadie: That was really the strength of our EfS program for me – that I was able to work successfully in a group, but that I felt like I had the strength of a group of people behind me even when I ventured out to do my own project. Alan: The dynamic development of our cohort as a learning community provided me with both a supportive environment and a way of measuring the impact of collaborative work on practice. Sherie: At a very fundamental level, I have faith in the capacity of humans to do and be good. I believe in the power of humanity. I hoped that if I created a learning environment in which you, as learning community, could build a sense of shared responsibility and interdependence you too would feel the power of your humanity—your collective strength and the gift of believing in one another. In these reflections we see our perception of the importance of our cohort in generating the sense that we were not acting alone in isolation; that we were a part of something bigger; that we shared a common goal; and that we felt accountable to one another. We suggest these perceptions of the importance of our cohort can be understood, in part, with Valarie Braithwaite’s theory of collective hope. She explains that in collective hope, “individuals’ goals become the shared social vision of what society could be like for its members. And individual’s sense of personal agency becomes the collective’s sense of empowerment or political efficacy, of being able to have one’s voice heard and having it join others to the point where it makes a difference” (2004b, 134). If we combine this understanding of power of collective hope with Reese & Bamberg’s contention that group identification encourages people to display commitment to the cause of changing society, to form coalitions with similar groups, and crucially, to act together in order to achieve their political goals” (2014, 467), we can see how we felt empowered by our membership in the learning community—our cohort. Diane: Hope inspires the action. It is an iterative process. As I feel hope for the future, it inspires me to take action. When I take action, I am more hopeful. It is this cycle of hope and agency that keeps the momentum for this movement. Sherie: How could I feel anything but hope and agency when I reflect on your individual and collective actions? …as I described all that you are doing and have done, it is clear to me that we were successful in developing, inspiring, nurturing, revitalizing your sense of agency. And this makes me unbelievably hopeful. We suggest that these reflections represent and support Valarie Braithwaite’s argument that “hope acquires its object-through shared feelings of injustice, through ideas for change, and through a sense of empowerment as the feelings and ideas are shared within a community. But most important is action. Once action is seen as being the companion of hope, social movements gain momentum” (2004a, 8). Most importantly perhaps, we believe these reflections demonstrate the ways in which “hope can be seen as a renewable resource for social change” (Lueck 2007, 253, citing Courville & Piper 2004, 57). What do these findings tell us about experiencing hope and agency in sustainability education and ways in which sustainability-oriented agency was generated and maintained within our cohort-based EfS advanced certificate program? Our conclusions are framed in our understanding of what we heard ourselves say with regard to these possibilities. In broad strokes, we said that there is an important relationship between hope and agency. We defined hope in terms of the changes and actions for a sustainable future that we see and would like to see, and we defined agency in terms of action. We said that we felt hope or were prepared to take action in the face of, or in spite of, our understanding of the enormity—if not impossibility—of the tackling issues of sustainability. We said that there were significant benefits to tackling these issues together. And we said there was hope in numbers. We were not alone, we were supported and our collective successes with sustainability action inspired hope which inspired further action. We said that becoming a member of and working together as a community made all of the difference. How, if at all, can the lenses we borrowed from collective hope, communities of practice and praxis help us make sense of what we said? We would argue the overarching framework of hope theory helps us understand the importance that we placed on seeing action or change in our definitions and our expectations for hope. Scholars like Valarie Braithwaite, Victoria McGeer, C.R. Snyder and Michelle Lueck all agree that hope and agency go hand in hand and they are mutually reinforcing (Braithwaite 2004a; McGeer 2004; Snyder et al 2003; Lueck 2007). This interdependence and reciprocality of hope and agency helps us understand the ways in which we “worked through” feelings of hopelessness and despair that stemmed from our critical readings and communal exploration of texts and materials that painted a bold and “grim” picture of our future. Seeing hope as a renewable resource for social change gave us the courage to act even if the outcomes of those actions were uncertain. In this way, we would argue that Tina Evans’ conception of clear-eyed hope (2012) emerged from the culture of our cohort. This hope came from our collective engagement in a program that asked us to attend to readings and materials that challenged our personal behaviors and our world views. Through our communal readings, we were able to critically examine and reflect on the ways in which our perceptions and actions are socially mediated and culturally regulated. In a manner consistent with praxis, understandings generated from these critical examinations inspired and informed our collective actions for sustainability. Conceptualizing ourselves as a community of practice in the Lave and Wenger sense helps us understand the value we placed on being a member of the cohort and the ways in which identifying with this group supported and propelled our collective action (Lave 1991; Wenger c2007). Consistent with Wenger’s definition of a community of practice, we are a group of people who share a passion for building paths to a sustainable future and we learned to do this better as we interacted regularly in our eighteen month journey together (c2007). As Lave suggested, we became knowledgeably skillful in the practices of educating for a sustainable future as we developed our identities as a member of our community of practice (1991). And as Reese & Bamberg predicted, this group identification encouraged us to display our commitment to the cause of changing society and to act together in order to achieve our goals for sustainability (2014). So what do we make of our findings? We would argue that our findings make a very strong case for cohort-based education for sustainability. They tell us that the culture of a community of practice engaged in sustainability education can be an antidote to debilitating pessimism. Our findings tell us that learning about seemingly impossible “wicked problems” as a community can undermine hopelessness, despair and paralysis. Tackling these wicked problems as a community of practice can generate productive collective hope. And if collective hope is a renewable resource for social action, our findings tell us that creating communities of practice should be the foundation and aspiration of any effort to educate citizens for a sustainable future. Braithwaite, V. (2004a). Preface: Collective Hope. Annals of the American Academy of Political Science, Volume 592, Hope, Power and Governance (Mar., 2004), pp. 6-15. Braithwaite, V. (2004b). The Hope Process and Social Inclusion. Annals of the American Academy of Political Science, Volume 592, Hope, Power and Governance (Mar., 2004), pp. 128-151. Courville, S. and Piper, N. (2004). Harnessing Hope through NGO Activism. Annals of the American Academy of Political Science, Volume 592, Hope, Power and Governance (Mar., 2004), pp. 39-61. Drahos, P. (2004b). Trading in Public Hope. Annals of the American Academy of Political Science, Volume 592, Hope, Power and Governance (Mar., 2004), pp. 18-38. Evans, T. L (2012). Occupy Education: living and learning sustainably. New York, Washington DC, Baltimore, Bern, Frankfurt, Berlin, Brussels, Vienna, Oxford: Peter Lang. Freire, P. (2000) Pedagogy of the Oppressed. New York, London, New Delhi, Sydney: Blumsbury. Lave, J. (1991). Situated learning in communities of practice. In L. B. Resnick, J. M. Levine, & S. D. Teasley, (Eds.) Perspectives on socially shared cognition. (pp. 63-82). Washington DC: American Psychological Association. McGeer, V. (2004). The Art of Good Hope. Annals f the American Academy of Political and Social Science, Vol. 592, Hope, Power and Governance, pp. 100-127. O’Neill, S., Nicholson-Cole, S. (2009). “Fear Won’t Do It” Promoting Positive Engagement Change Through Visual and Iconic Representations. Scientific Communication, 30 (3), 355-379. Rodgers, C. (2002). Defining Reflection: Another Look at John Dewey and Reflective Thinking. Teachers College Record, 104 (4), 842-866. Sheppard, J. (2004). Reducing Pessimism’s Sway in the Environmental Ethics Classroom. Worldviews, 8 (2-3), 213-226. Technology Assistance Program (2000). Action + Reflection=Learning. TAP Into Learning, 3 (2), 1-2. Wenger, E. (c 2007) ‘Communities of practice. A brief introduction’. Communities of practice [http://www.ewenger.com/theory/. Accessed August 15, 2013].